March 16th from 3pm-9pm in Downtown Stuart Riverwalk Stage area. Tickets are $8 in advance including a free green beer. Online Ticket Holders: You will not receive a paper ticket. Your name will be on the pre-sale ticket list at the main event gate on St. Lucie Avenue. Please bring your receipt and a photo ID for admission. Online Ticket Holders: You will not receive a paper ticket. Your name will be on the pre-sale ticket list at the event gate. Please bring your receipt and a photo ID for admission. 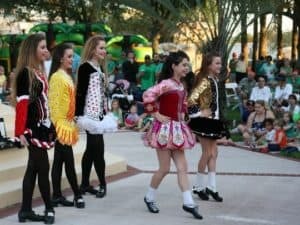 The mother of all Saint Patty’s Day parties promises music, Irish fare, and St. Patrick’s Day fun for the whole family from 3:00 – 10:00 p.m. on Saturday, March 17 in Gazebo Park. 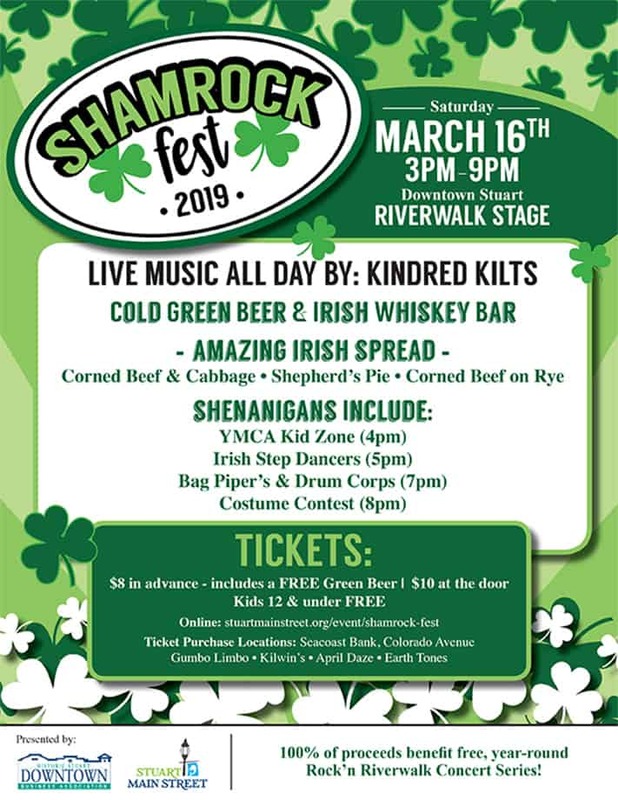 The day’s shenanigans include Bagpipers & Drum Corp performances at 5:00 p.m., the YMCA Kids Zone at 4:00 p.m. and Irish Step Dancers at 8:30 p.m. The title of King and Queen of the Green will be awarded to the best-dressed male and female at Shamrock Fest. 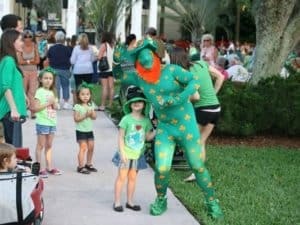 Each winner will take home their own pot of gold – a $100 cash prize from Orange Theory Fitness in Jensen Beach. 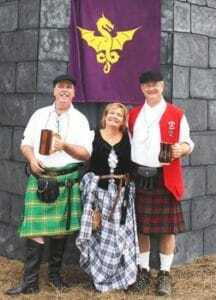 The costume contest will take place at 7:00 p.m. Admission is $6 in advance and $10 at the door, with kids 14 and under free. Tickets can be purchased here or in Downtown Stuart at Seacoast Bank on Colorado Ave., Gumbo Limbo, Kilwin’s Chocolates & Ice Cream, April Daze or Earthtones. 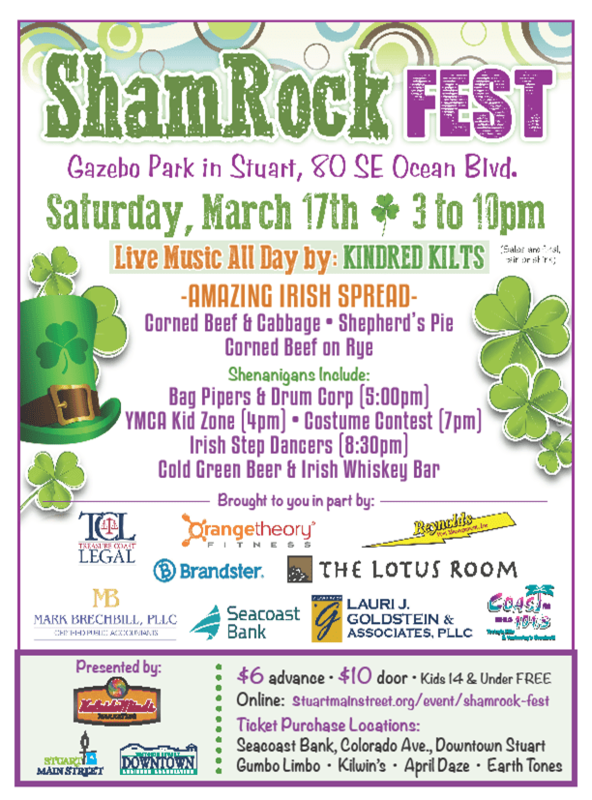 Shamrock Fest is presented by KaleidoMinds Marketing, Stuart Downtown Business Association and Stuart Main Street. The event is sponsored by Seacoast Bank, Treasure Coast Legal, Coast 101.3, Orangetheory Fitness, Reynolds Pest Management, Mark Brechbill, PLLC, Brandster, Lauri J. Goldstein & Associates, PLLC and The Lotus Room.